I have finally found some shoes that really get me. They work for fancy or dressed down and are eco friendly. The brand is Rothy’s and they are based out of the San Francisco area. I’ve got three pair now and have started sewing clothing specifically to go with my shoes. Don’t mind my husband and dog in the background lol. Last time I ordered I got 4 pair and kept the shoes that fit best. I kept the jade loafers and mixed stripe rounds and will probably get a pair of points soon. I am a huge Arsenal soccer fan and the red camo points look great with all my Arsenal gear. Rothy’s have grown a huge following similar to the Tieks flats with Facebook fan groups where you can chat and mingle with other Rothy’s lovers and even buy, sell and trade shoes. If you are looking for a great shoe ladies, this is one to look into. If you are a first time buyer feel free to use the code below to get a $20 discount on your first pair! It’s been about a million (or 2) years since either myself or Ross has posted anything so I thought I’d give it a whirl. I have still been doing me in all this time I haven’t blogged. Sewing, gardening, some exercising type things, occasionally making things with tools, photographing and mom-ing for a small wild gal and 2 Vizsla’s that all are in a constant attention needing competition. Back in 2016, I was mostly sewing clothes for my little person and myself but boy this year I have stepped up my game. My daughter’s preschool has mandatory fundraising and all those type of requirements so I for some reason ended up volunteering to make a purse for an auction they were having. I had never made a handbag before but I had wanted to get into bag making. Unfortunately, this typically requires heavy machinery which I didn’t have. So, I got myself a Sailrite Fabricator which would sew through my hand if I was stupid enough to test it out or terrible at sewing. I found a pattern I really liked from Swoon patterns called the Brooklyn in the traveler size and cut out fabric for two bags. I then proceeded to make the first. It turned out like this. Not bad for a first timer and I figured out my mistakes like don’t use blue chalk to mark your fabric because it will be there permanently. Then I made this one for the auction. I made it out of Pendleton fabric hoping that would bring a bigger price tag. I thought it did alright selling for $165 although I hoped it would break $200. Either way not a bad start and I got a new sewing machine out of it. After this I wanted to make myself a new bag but my mom’s birthday was right around then so back to Swoon and I picked up the Glenda pattern and it turned out so nice. I might make myself one of these at some point. Then my girl who is obsessed with all things dogs really was feeling left out so she got a doggy purse just her size. She likes to shove all her little toys in it and off to Costco we go. She will just hang out in the cart and play and I can actually get some shopping done without having to chase her all over the store! Sometimes. After that, it was getting close to Mother’s Day and then someone at the preschool sent an email saying the week before was teacher appreciation week. What? Like I love teachers, don’t get me wrong. But…how come I birthed this child, spend all my time keeping her alive and I only get a day but teachers get a whole week. I pay a bunch of money for my kid to go to this preschool for 9 hours of peace per week! Ugh…but I do like my daughter’s teachers sooo… I found the Heidi pattern from Swoon and made these two bags. Finally! I can’t think of anyone else to make something for beside ME! So, we have a trip coming up to Yosemite and I decide to make myself the Swoon Atlas rucksack. I do the usual and cut out fabric for two bags. I am busy getting everything ready for the trip the same week and only finish one of the bags which was my sample to make mistakes or figure out what I would like to change for my bag. So, I took an old backpack I already had to Yosemite and this is what my bag currently looks like haha… Hopefully, I will finish it soon. In all of this I realized I really like bag making and maybe if I figured out how to own a business I would start a business sewing up bags. Ross suggested I call my business Beth’s Garbage Bags. Thanks Ross!! If you have suggestions for a business name feel free to leave a comment! this shirt trumps yours. try putin it on. im just so darn funny i know. such a smug face. 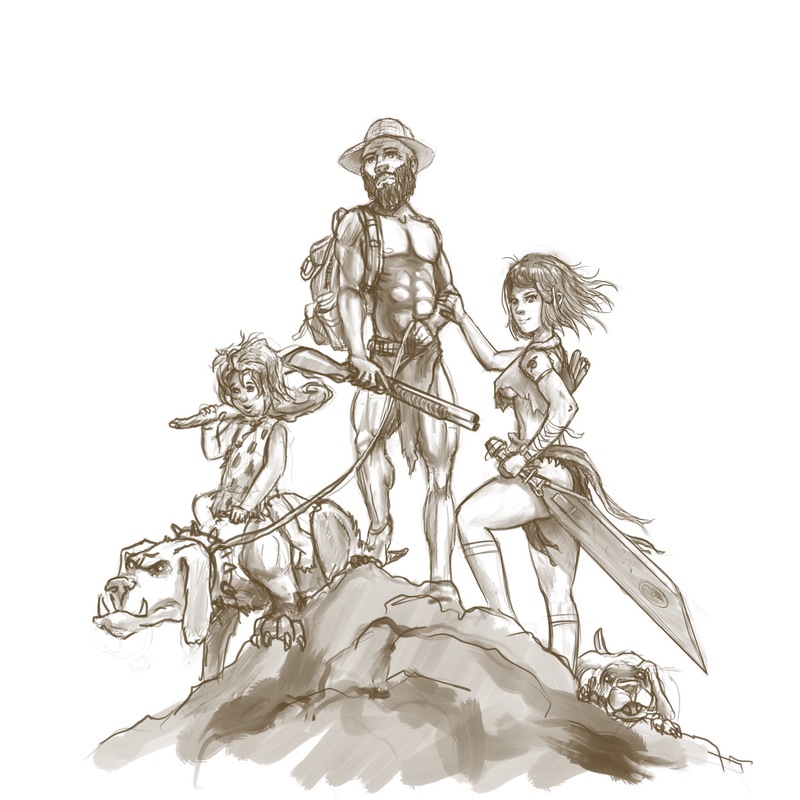 Inspired by frank frazetta and edge of tomorrow. Decided to keep it realistic…my wife really hates that hat, plus she is not too fond of being drawn scantly clad either. Pretty sure my daughter (2.5 year old) would love to ride around on Liga though. finished the neptune/poseidon tat design. 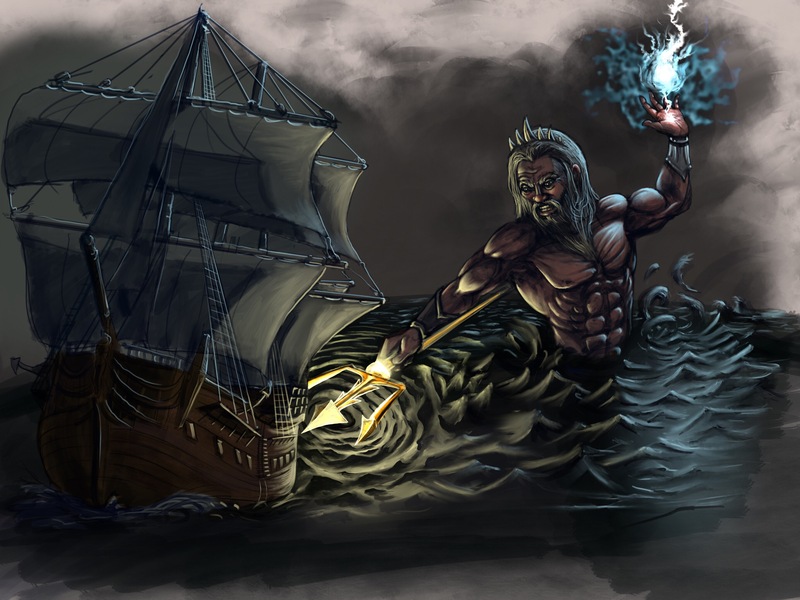 Poseidon attacking black pearl…or something. I like the quick original more. 100% done in Procreate with Apple Pencil.